Deep Blue Divers, the dive center at Six Senses Laamu has expanded the array of unique activities offered to their little VIP guests by introducing PADI Seal Team, a special program designed for children keen to discover the adventures of scuba diving. Through a series of AquaMissions in the PADI Seal Team program, young guests of Six Senses Laamu can discover the hidden beauties of the magical underwater world and learn to float effortlessly like a weightless astronaut. 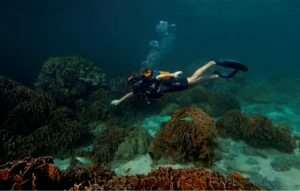 Although the two-part program was originally designed to be conducted in swimming pools, the Professional Association of Diving Instructors (PADI) has extended special permission to Deep Blue Divers to carry out the program in shallow water around the island. After parental approval has been obtained, the instructors will take the children into the ocean to a maximum depth of 6 feet (1.8 meters) for their first AquaMission. After the successful completion of the fourth AquaMission, the children can advance to 13 feet (4 meters) deep. A further five specialty missions are available to become a Master Seal Team member and children can even do a night dive as one of their missions! 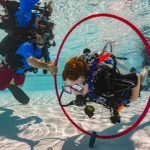 Little VIPs of age 8 and above are eligible to sign up for the PADI Seal Team and this course nicely complements the PADI Bubblemaker course also offered at the resort. “We are delighted to announce another out-of-the-ordinary experience ahead of the school holiday and festive period. Under our Grow With Six Senses programming we make a continuous effort to make the time youngsters spend at Six Senses Laamu an educational and enjoyable experience. Through the PADI Seal Team program we aim to build a generation of young divers who are environmentally aware and promote the sustainable diving experience,” said Marteyne van Well, general manager of Six Senses Laamu. Be it Bubblemaker or Seal Team, these PADI courses are bound to create amazing memories for young guests and provide parents with a structured program that lets their children develop skills, learn about the aquatic environment and have a lot of fun. The friendly and professional team at Deep Blue Divers prides itself on educating children to be better buddies to each other and our fragile underwater world.